Some see “voluntourism” as a bone fide tourist product in itself, to be offered to the tourist market as one would do with any other niche market product. Volunteering while educating on vacation. Some feel that “voluntourism” by its very definition should be a strictly ‘non profit’ activity and therefore has no place in ‘tourism’ at all. Track of the Tiger T.R.D., a 2006 SKAL Ecotourism Award winner sees it differently. The company sees “voluntourism” as a genuine development tool, with potential value far beyond that of the gratification it gives the participant for having build a house or painted a school, and well beyond the value that the ‘one off’ intervention has to the recipient community. Track of the Tiger T.R.D, through its non-profit initiative VWB (Voluntourists-without-borders) is using “voluntourism” to alleviate rural poverty and to address environmental conservation issues. It does so by focusing the financial and ‘hands on’ assistance of its participating volunteers on the development of world class ecotourism products, that will be owned and operated by the rural Thai and ethnic minority villagers of northern Thailand. Paying volunteers work alongside their village co-workers in the development of the product. Accounting for the monies paid is transparent and covers: food, accommodation, transport, co-worker’s day rate, and a fixed per diem contribution to materials used. 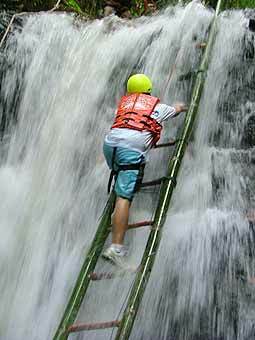 Climbing one of the 17 waterfalls along the trail. Funding for marketing and general overheads, is covered by Track of the Tiger’s own CSR fund, and subsidized by donations from individual and corporate sponsors. This clear separation ensures that the individual donor sees his or her funds, and hands on effort directed to a specific task on the front line, and does not have 60-80% of those funds absorbed by salary and overheads costs. The villagers and volunteers work at their tasks in an environment of mutual respect that allows the visitor a genuine grassroots experience, and the villager the opportunity to showcase his or her extensive ‘local knowledge’. VWB’s first product, the ‘Pang Soong Nature Trail’ is a stunning 4 hour walk along a pristine forest trail that follows the Mae Lai stream from the trail head at 1’000 m above sea level back into the mountains, and over or around some 17 waterfalls to the source at approximately 1’500 m.
The project is a private sector/village community joint venture. Track of the Tiger and its partners own the Pang Soong Lodge, Outdoor Education & Research Centre located at the trail head, and the village community own the rights to the community forest through which the trail runs. Under a 10 year Ecotourism development agreement, Track of the Tiger sources funding and provides volunteers to build the features and provide the resources for the trail development. 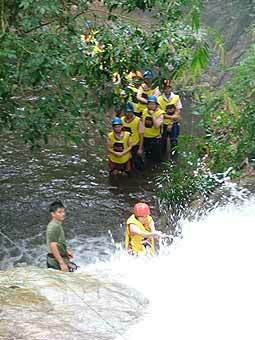 The villagers levy an entrance fee for each tourist using the trail, and provide local trainee guides with good ‘forest knowledge’ to accompany all visiting groups. The VWB, Pang Soong Lodge and Track of the Tiger also provide training and job opportunities to those in the local community who wish to enter the tourism industry. The stakeholders have set themselves the 10 year goal of having the future managers of both the nature trail product, and the lodge itself, come from within the village community. Poverty alleviation, environmental degradation, human rights abuse and fair trade practices are all areas in which the tourism industry as a whole can and should bring its collective influence to bear. We therefore appeal to each of you individually for your assistance in promoting and marketing the VWB Initiative, in order that it may be developed to its full potential, and then replicated elsewhere. 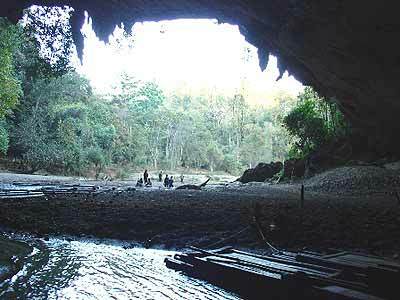 Pre-historic sites first identified in Mae Hong Son 40 years ago include rock shelters and dugout log coffins used by inhabitants of the region 2,000-plus years ago. Under a grant from the Ambassador’s Fund for Cultural Preservation, the U.S. is supporting the work of Silpakorn University professor Rasmi Shoocongdej to involve the local community in protecting the Ban Rai and Tham Lod rockshelters in Mae Hong Son province. The preservation project is located in highland Pang Mapha, a small district in Mae Hong Son Province bordering Burma’s Shan State. This mountainous area is increasingly popular with Thai and foreign tourists who come for rock-climbing and cave exploration, activities that threaten over 60 sites discovered in the area, including burial, habitation, manufacturing, ceremonial, and rock painting sites. Ambassador Ralph Boyce presented the $34,600 grant to preserve the pre-historic Ban Rai and Tham Lod rock shelters, noting that these important sites, evidence of Thailand’s ancient past, are threatened with destruction and damage from unsustainable tourism practices. Courtesy of the U.S. Consulate in Chiang Mai.